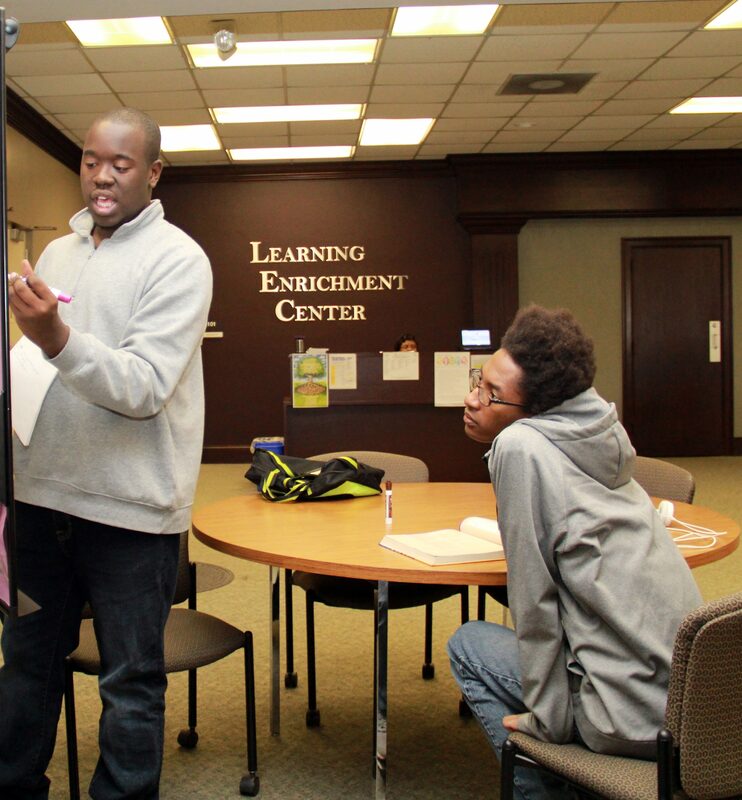 The Learning Enrichment Center (LEC) assists students in identifying their academic needs and provides them with support that will strengthen their academic skills, helping them become more confident students. The LEC is also here to provide guidance for students as they begin to navigate their way through their college experience, leading them to the most helpful resources on campus. Individual tutoring sessions provide students with the opportunity to meet one-on-one with a peer tutor. Peer tutors are well-versed and able to help students in a number of different courses. Individual tutoring can be set up by appointment, according to tutor availability, and can be arranged to take place on a weekly basis. The LEC has drop-in tutors available during specific time blocks for the most in-demand courses. No appointment is necessary. For the most up-to-date drop-in schedule, please stop by the LEC. Small group tutoring is also available by appointment and can be arranged to take place on a weekly basis. The LEC can provide an assessment of your needs to determine the type of assistance that will best suit you and can help you develop the needed skills to become the successful student you want to be. The Harbert Writing Center (HWC) offers free consultation services to writers at all stages of the writing process. HWC is located in Comer Hall, Room 311.